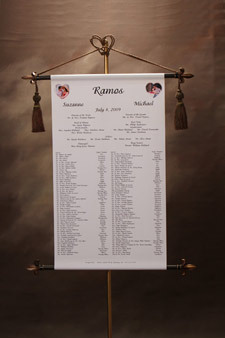 Seating Scrolls are the most elegant way to get your guests to their table. We custom design each one to match your theme or color of your special day. No more messy place cards to deal with. 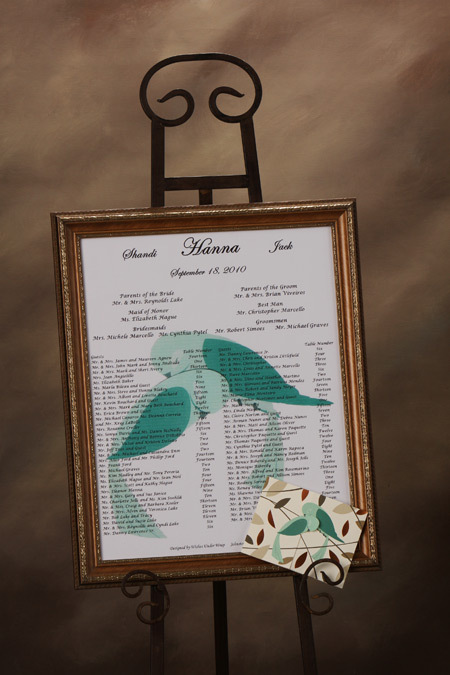 You have a permanent record of who attended your wedding and a beautiful keepsake to admire. The seating scrolls pictured here are some of our favorite styles. Let us custom design one for you. 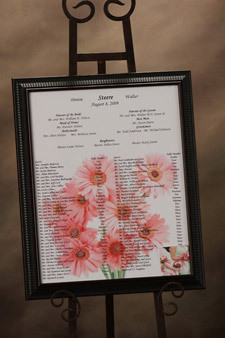 It will add that special, elegant touch to your wedding reception and become a lasting keepsake. 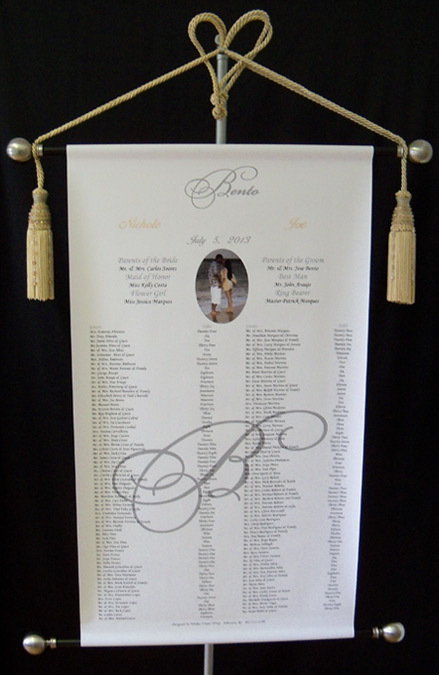 To order your seating scroll please call us at 401-232-1190. 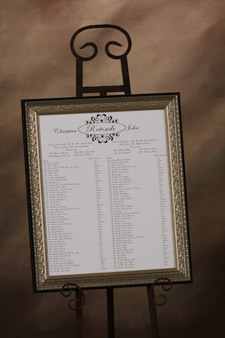 Do you customize our seating scroll? 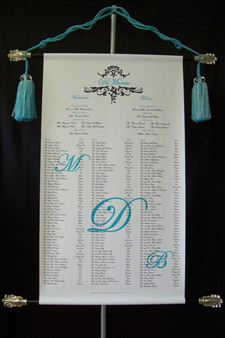 Each scroll we design is customized to your wedding colors and theme. 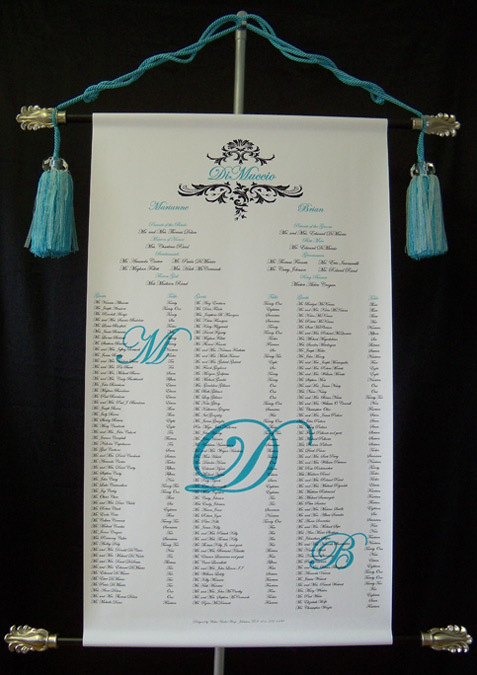 Whether you choose your scroll to be framed or hung with beautiful tassels it will be designed with your day in mind. 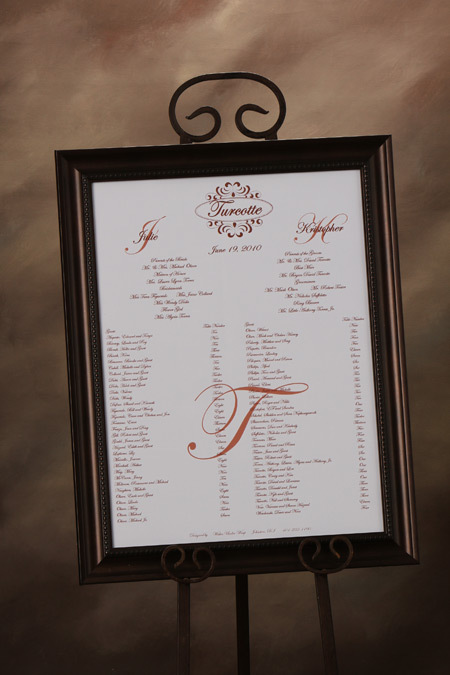 We have a variety of designs for you to choose from or you can let us find a design for you. 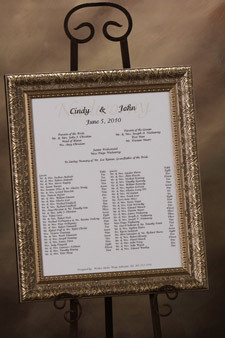 Often bridal couples will use a design from their wedding invitation. We offer a number of fonts for you to choose from. We can also decorate your scroll to match your reception with pretty silk flowers, elegant ribbons, lace, seashells, ivy, autumn leaves and more. We can also add a photo to your background. When should we reserve our date? We ask that you reserve your date asap. It is never too early. To reserve your date we do not need to know the final design or details, this we will confirm as we approach your wedding day. To reserve your date please call 401-232-1190 or email us. We require a $100.00 non refundable deposit to hold your date. When do you need our names? 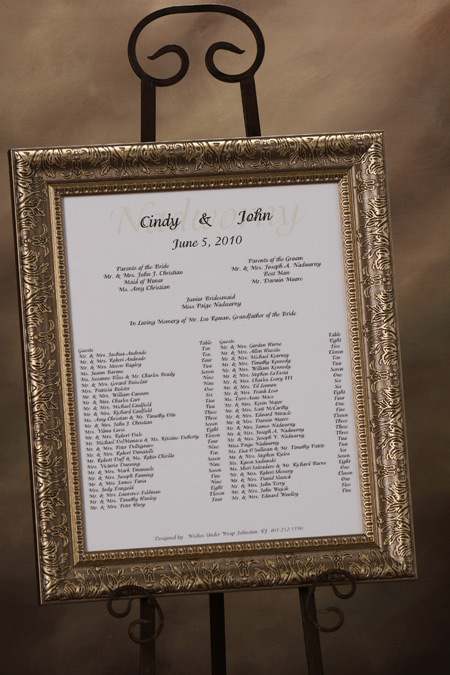 We ask that you email us your names at least 2 weeks prior to your wedding date. We send you a proof and any changes can be made at that time. 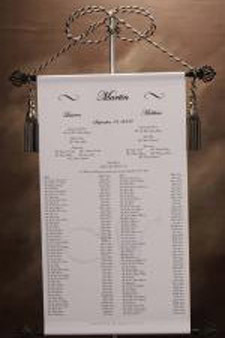 seating scrolls are usually ready the Wednesday prior to your wedding date. We did not reserve our date, Is it too late? We can accommodate rush orders when scheduling permits. What does a seating scroll cost? All our seating scrolls are one price, $250.00. 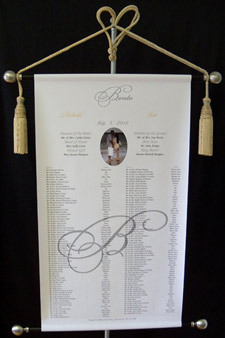 This includes set up, design work, free proofs, frame or tassels, and decorations all which are yours to keep. We require a $100.00 non refundable deposit to hold your date. We offer payment plans and layaway for our bridal couples. Balance is due, cash or credit card, when the seating scroll is picked up. We provide delivery or shipping at an additional charge. 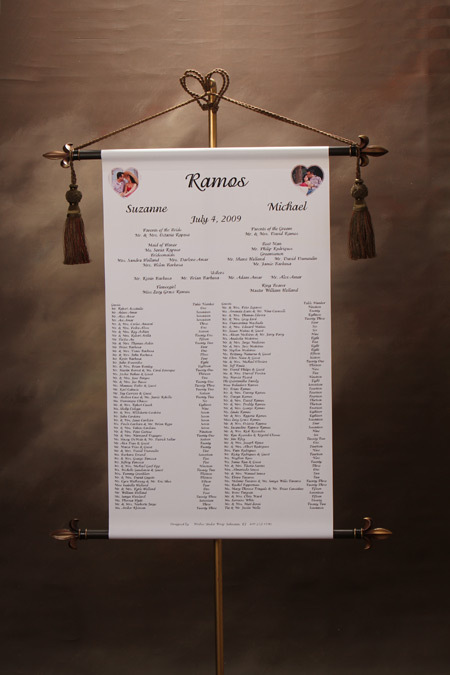 Do you design seating scrolls for other events? Seating scrolls for bridal showers, baby showers, birthday parties and other smaller events are priced by size, usually $100.00 or less depending on number of guests and art work. How is the wedding Party listed? 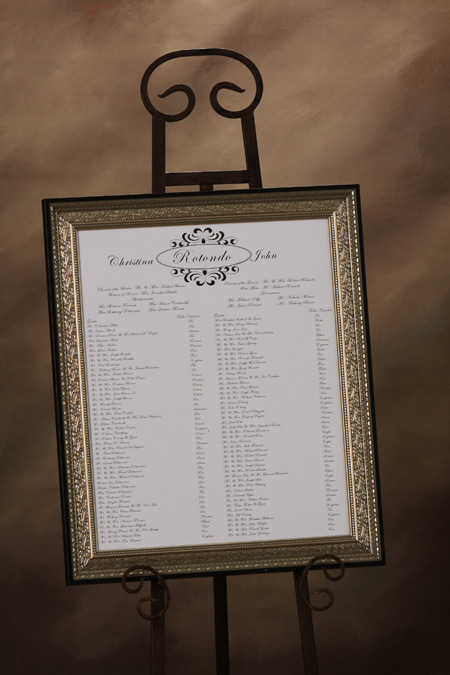 We list your wedding party, parents, and/or grandparents at the top. If someone close to you has passed away we can also include a special section "In Loving Memory" at the top. Do you provide a stand? For hanging seating scrolls we let you borrow a special stand. 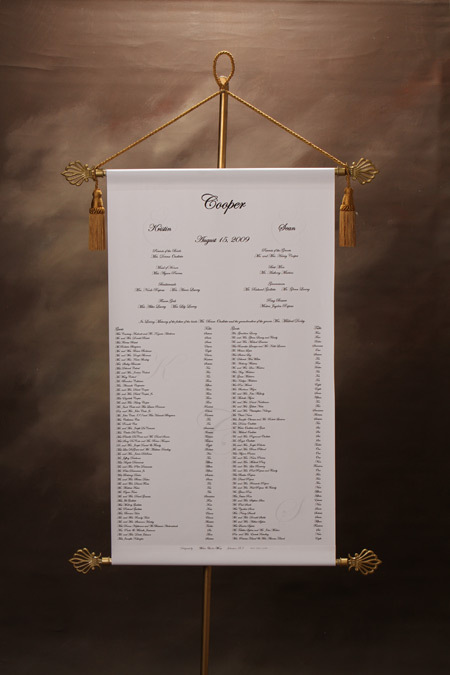 We also have easels to borrow for framed seating scrolls, if your venue does not have one.